You may know how to put ringtones to iPhone. However, when it comes to extract from iPhone iOS 12/11/10, you may find it hard to handle. iTunes allows you to transfer purchased tones but not custom ringtones. But what if you want to share your own ringtones with friends or want to transfer the ringtones from old device to your new iPhone? Don't worry, here we make things very easy for you. If you can get your hands on a really good third party application, you’ll find that these alternatives often perform more efficiently and offer far more freedom than iTunes. By far the best iPhone manager that I’ve come across is iMyFone TunesMate iPhone Transfer application. Besides streamlining the process of transferring your ringtones to your home computer, it comes with an incredible list of added features and capabilities that you simply can’t ignore. Manage Ringtones: transfer tones from/to iPhone selectively; create your own custom tones; delete unwanted tones from iPhone. Sync without Data Loss: Syncing iTunes/PC files to iPhone won’t delete existing files or erase iPhone. Purchase & Non-Purchase: It can extract purchased and non-purchased files from iPhone selectively. 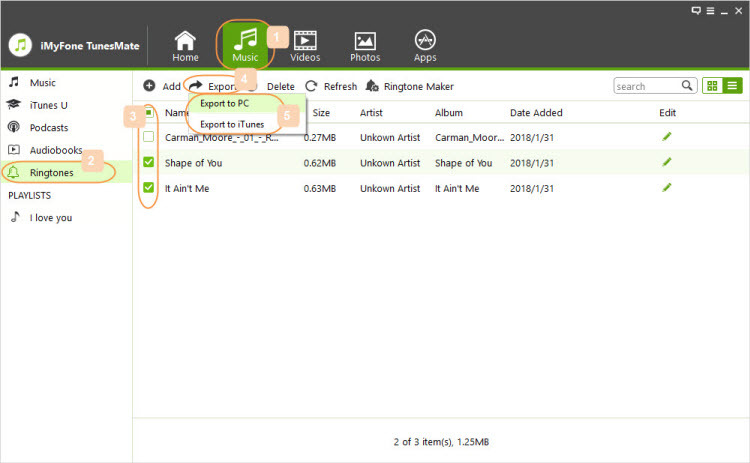 Smartly Manage Media: like to export, import, back up, delete, edit files or and manage playlists. By far one of the most refreshing aspects of iMyFone’s TunesMate iPhone Transfer is its ease of use and simple lay out. Step 1: Plug your iPhone in via USB and let iMyFone TunesMate open. Step 2: Simply go to “Music > Ringtones”. Step 3: All your purchased or custom ringtones will be displayed there. Select your desired ringtone and click “Export”. Export to iTunes: It will transfer the selected tones to your iTunes library. Export to PC/Mac: Select a local folder and the tones will be extracted to that folder. Trustworthy, there are lots of famous software review media recommending iMyFone TunesMate to be the ultimate iPhone transfer tool, like getintopc.com, tricksworldzz.com, crunchytricks.com, etc. Naturally, your first plan of action would be to investigate whether or not iTunes can properly handle this. The short answer is “yes”, but not without its complications and limitations. Step 1: Make sure the computer that you’re using has been properly authorized to play your iTunes Store purchases. You can grant authorization to your computer by going to “Account > Authorizations > Authorize This Computer” on your iTunes and click “Authorize”. Step 2: Using your iPhone USB charging adapter, connect your device to your computer through a free USB port. Step 3: Once your device has been recognized by iTunes, go to “File > Devices > Transfer Purchases from [your device]”. This will help you to extract all the purchased files from iPhone to your iTunes library, including music, movies, audiobooks, TV shows, ringtones and more. iTunes will only support tones that were purchased through the official iTunes Store. This severely limits your freedom when it comes to tones that you created yourself or customized from a purchased source. Furthermore, there has been various reports of bugs and critical errors within iTunes that has resulted in major data loss and unwanted erasures. You can’t selectively extract only the specific ringtones from iPhone. Transferring all the purchased files from iPhone may cause lots of duplicate files on your iTunes library. While iTunes limitations are continually growing more apparent and restrictive, countless third-party developers are adapting and designing intuitive alternatives that get the job done more efficiently. In my experience iMyFone TunesMate iPhone Transfer not only does a better job completing this task, but this application grants far more freedom to the user and offers a much simpler layout.